By Ted Bade, © Copyright 2011, All Rights Reserved. 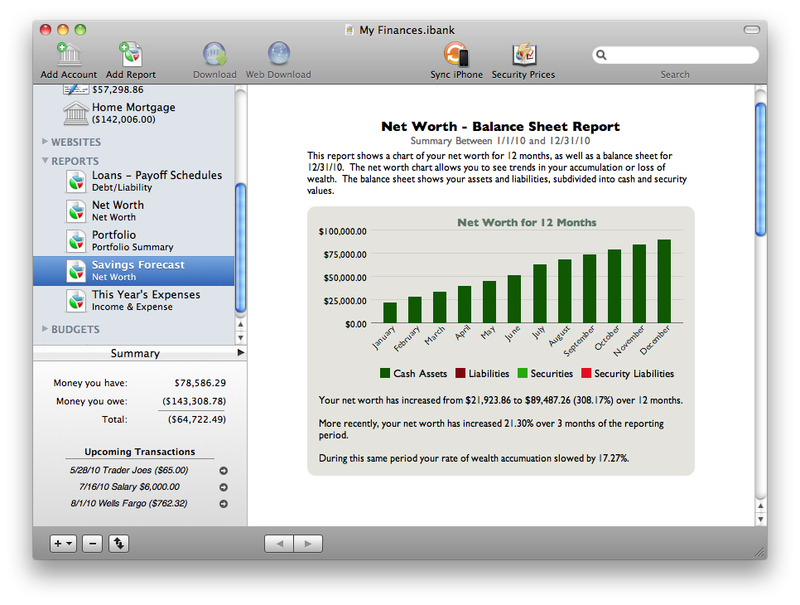 iBank is a terrific alternative to any version of Quicken. It is robust, has an intuitive easy to use interface, and offers a lot of useful tools for managing your personal finances. If you are looking for an alternative to the old Mac versions of Quicken and/or find you cannot stomach the pathetic “Quicken Essentials”, you won’t go wrong with iBank. I will be looking at iBank from the viewpoint of a person who has been using Personal Finance applications for well over ten years. This also means I have many habits and expectations about a financial program (both logical and illogical ones ☺), as well as a LOT of financial history. Also, my data needed to be transferred to iBank manually, not imported from an old Quicken file, because I did try using Quicken Essentials for a time before moving to iBank. There is no way to import QE saved data into iBank. However, iBank will import files from the older versions of Quicken, including Windows versions. The import process brings in your various accounts, transactions, investment account information, and budget categories. It won’t bring in scheduled transactions, reports or budgets. There is one issue to consider with regard to importing from Quicken. iBank doesn’t use the Quicken save or backup file to import, but it imports from an exported QIF file. In my case, I had already converted to Lion (MacOS X 10.7), and had been using QE for a while, so there was no QIF export available for me. If you don’t export from Quicken before you convert to Lion, you might not have any way to run the old version of Quicken to perform the export, which means that you will have to do the import manually. I expect that the same thing would be true if you were previously a Windows user, and didn’t manage to keep your old machine (perhaps it died, which is the reason you are converting financial applications). I imagine a Window’s user would have one option of running Quicken for Windows in a virtual Machine on the Mac to perform the export file creation. Author’s Note: Being a curious kind of guy, I asked iBank’s customer service what my options are. I was pleasantly surprised by the reply. Essentially, their customer service department offered to do the conversion for me. They provided a small script app to grab the data and to create a secure file that could then be emailed to customer service. For QE files, they suggested asking Intuit to do the conversion. So, even if you made the jump, there are options. Great job IGG Software customer support!! If you have a QIF file to import, the process is pretty nice. iBank analyzes the file you give it, and then asks you to verify the the account types. This is mainly due to the fact that iBank offers more account types than Quicken does. You can choose to change an account type to one of iBank’s more specific choices. iBank then translates the date into a new iBank file. Once it is done, you need to go through your accounts and make sure they are correct. In the case of the file I imported, it has a muddled history going back to early 2001, so the import would probably have required more work then just stating over. This was my fault, since I did a poor job of cleaning up my Quicken files and they had issues. I don’t expect there would be any real issues for people importing with only a few clean years of history, or even ten years of well kept files! Ideally, it would be terrific if you could run iBank side by side with Quicken (or any of the other financial applications it can convert from), to verify account data. One thing I have learned about financial programs (and it actually applies to any program), is that the people involved with creating it decide on a method for doing whatever it is that the program does. This method may or may not be exactly the method you are familiar with. When I attended elementary/high school, there wasn’t a course covering personal finances. So most of my methods have been monstered together from what I have learned from various sources, friends, books, and financial applications. Consider also, there is an element of anxiety in moving to a new financial application. A simple mistake might mean an important loan payment is forgotten or a checking account is over drawn. Because of this, one needs to pay particular attention to what actually happens when you use a new program. Don’t assume anything. In my case with iBank, years of complacency using one version or another of Quicken left me expecting an application would respond in a particular way. iBank is not a clone of Quicken, and so it follows it’s own set of rules and processes. I say this not to criticize, but point out the way it does business. I want to point out iBank works differently than Quicken, and new users need to consider each action taken while learning the software. Once past this awkward application learning period, people should find that iBank is very intuitive and easy to use. iBank provides a view of your finances when it initially opens. On the left side there is a column that gives access to various things, such as accounts, websites, and other functions. The right side is a window showing information about the item selected on the left side bar. For instance, if you have selected an account, the register is shown, if you select a web site, the browser function opens to load it, or if you select a report, the report is displayed. The side bar offers a lot of choices, more then will show on the screen, you will have to scroll down to find everything. Accounts occupy the top of the list, which makes sense, since you will spend a lot of time working with them. The side bar offers areas for Accounts, Websites, Reports, and at the bottom a Manage area providing a variety of functions (including syncing with the mobil version of iBank, which I didn’t test). Accounts are organized in order of creation, but the user can drag the icon to any position. I personally like to keep my most active accounts near the top, for easy access. Transaction registers offer three views. The regular register looking view, a cover flow view, and a reconcile view. I am not totally sure what functionality the cover flow view actually provides. It allows one to slide along through the transactions in the account in a cover flow like method (displaying the icons related to the accounts). It also provides a chart on the bottom showing the value of the account over time. Clicking on the chart brings up the transaction you clicked. The chart lets you visualize the account value over time, so you can see the rise and fall of a checking account from paycheck to paycheck. It also shows the minimum and maximum values in the account. For a credit card, you can easily find the periods of most charging. One things I really like about iBank is that it can be very visual. For instance, iBank uses icons for various category types to make it easy for you to recognize them in a register. You can use the ones included in iBank or find those of your own to use; the process is as easy as cut and paste. You can also set a color to a category, then the register line for a transaction of that type is tinted with the color. For instance, I use green for grocery transactions. When I look at the register, it is easy to locate all the grocery transactions by finding the green tinted ones. Both of these methods are a big benefit to people who are very visual. 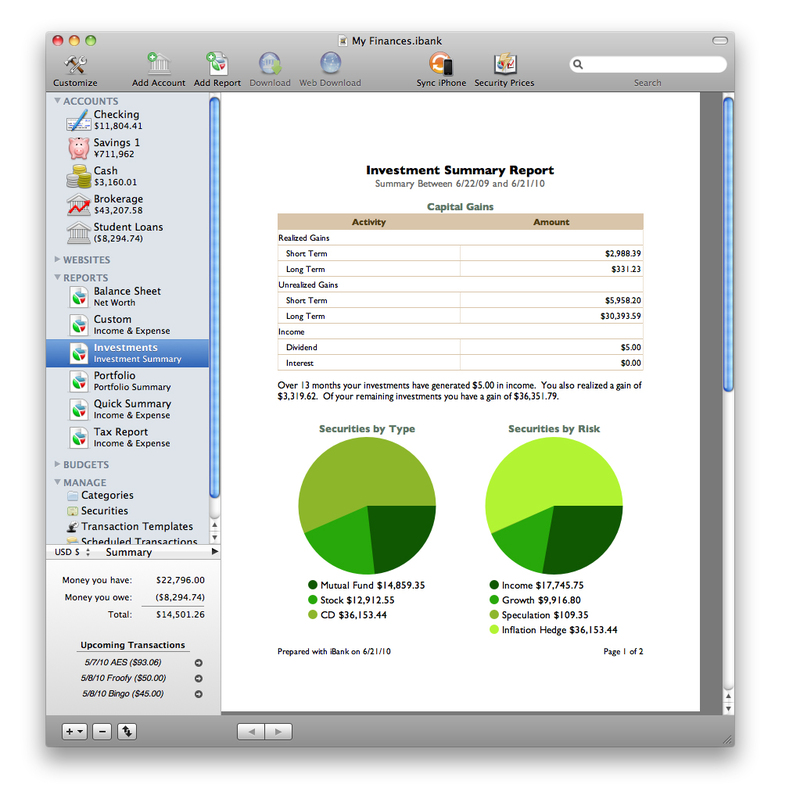 You can choose to have a tool bar near the top of the iBank window, below the menu bar; the default tool bar option has buttons for several common features. The tool bar can be changed to satisfy your way of doing things. For instance, iBank has a calculator function, which can be added to the tool bar if you find it useful. Alternatively, you might not want the tool bar and be content to use the menus. 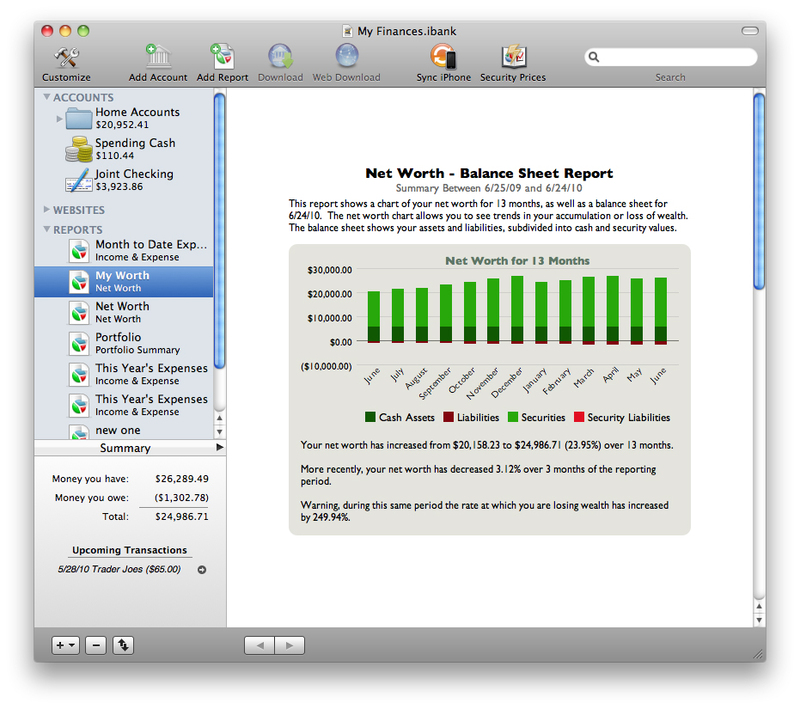 Finally, the iBank window offers a summary area (Summary Page) showing how much you have and how much you owe, it will also turn into a “Net Worth” bar graph if you click it’s top bar. This summary gives a quick overview of your financial picture. This area covers the lower portion of the side bar, and you can choose to hide it if you would rather see more of that area. Before you start using iBank, you will need to create (or import) all your accounts. If you are in a position to import from another financial program I highly recommend doing this. Although you should spend some time making sure the translation was correct, you won’t have to spend the time it takes to create each account individually. One improvement I would like to see with iBank’s manual is a section giving a logical method for people moving accounts in manually. Their manual is written with the view point that all accounts have been created and all you might need to do is create a new account to add to the picture. While the manual explains quite well how to create new accounts, it doesn’t suggest an order to create them in if you start from scratch. I highly recommend that you begin with the checking (or whatever other) account you use to pay the majority of your bills, followed by any others you use for this purpose, then create credit card accounts, loans, and finally investment accounts. The reason for this is simple, if you pay your bills, credit cards, loans, and investments from one or two accounts, it is a good idea to have them created before your download transactions for these other accounts. iBank easily downloads data from your financial institutions. When you create an account, after naming it, you choose which type of account it is, savings, checking, credit card, and so on. Then iBank downloads the current list of institutions that fit into this category. Hopefully you will find your institution in this list. If not, then you can enter the company’s web site manually or enter all your transactions manually. iBank checks for new financial institutions every time you create a new account, unless you create several of the same type one after another. While this is a safe method of business, it does prove a bit tedious waiting the short time for it to check. I found myself tapping the screen muttering, “Hey buddy, I saw that company in the list yesterday, you don’t have to check again”. One VERY cool feature iBank offers is an in program web browser. While some companies allow iBank to download data directly, many others require that you log into your account and download a file. While it isn’t a big deal to run Safari and get the files, the neat thing about iBank’s browser is that when the file is downloaded, iBank takes it in. You don’t have to save it, then open the saved file with iBank. I ran into one odd issue, more with my bank then with iBank. One of my banks requires Safari 4 on the Mac, which means that neither my Lion hyped Mac nor iBank can get transactions from this bank! I did manage to get the transactions using an old version of FireFox. While I can almost justify not having tested Safari 5 yet, I was aghast at needing to use Firefox 3.x! Logging into the bank with iBank is identical to what you would do with Safari. You will still need your passwords and user name and any other pieces of information the bank might require. There is one issue with iBank’s browser. One financial institution required that a second browser window be opened to initiate the download. iBank’s browser cannot open a second window. In this case, you need to use a regular browser to get the data. Overall, it is very convenient having a browser built into iBank. Day to day usage of iBank is simple. 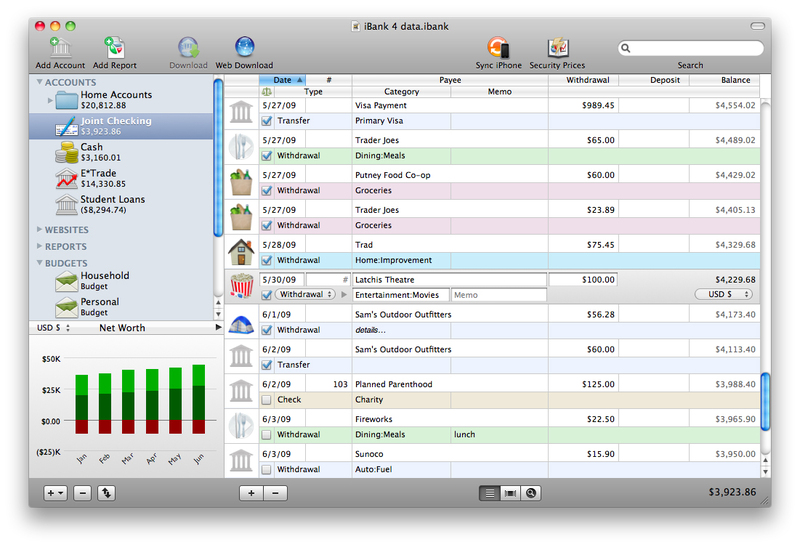 iBank keeps track of how you do transactions and uses auto fill to reduce your work. For instance, I download my credit card transactions. iBank opens a two pane window, the top showing the newest downloaded, the bottom showing the current register for that account. You look at the transactions and choose to accept them or not, when done you click to bring in all those you accepted. As you begin using iBank, you teach it which categories various transactions refer to. iBank allows you to create a “rule”, that says something like, all payments made to a specific grocery store go into the category of “Groceries”. Now when iBank sees a transaction with that grocery store, it fills in the category for you. However, some stores have multiple purposes. You can choose to either not create a rule, which means you enter a category every time you download a transaction, or you create a rule, then change the category when the need arises. One issue with not creating a rule is that iBank asks to create a rule every time a transaction from this company shows up, until a rule is created. Ultimately, this autofill feature saves a lot of your time. I like to verify that a credit card transaction matches the receipt that I have. There are a variety of reasons for doing this. iBank doesn’t provide a check box or space to indicate that a receipt was verified. Sometimes I need to make sure that one or another transaction was actually made. I have been hit twice by transactions not made by the household showing up on a credit card. I like to take action quickly! iBank comes with a lot of pre-made categories. As you type a name in the category field, iBank provides a list of categories that fit the letters you type, the list gets smaller as the word completes. While this is a real time saver once you know all the correct names, iBank doesn’t search for the string anywhere in the name, only from the beginning. This process could be made a lot easier if they had used a Keyword search, rather then a Browse search method. So there is a learning curve here. If you choose to use their method, you need to learn it. iBank organizes categories in groups, then by sub-categories. There is a group called “Utilities”, with sub-categories such as Utilities:Cable, Utilities:Cell Phone, and Utilities:Electric (notice the use of the colon to designate the sub-category). I download a transaction that shows a payment to my cell phone company. If I type “Cell phone” into the category field, iBank finds nothing, since iBank lists this as “Utilities:Cell Phone”. You need to understand their syntax/structure to find the correct category. This is only an issue the first time the transaction comes up. Once you create a rule, iBank fills it in, so you don’t have to type anything unless you need to change the category. It also gets easier as you become comfortable with iBank’s category naming methods. When you need to find how iBank names a category, you can use the menu option to “Change Transaction Type”. Clicking on this menu item opens a list of all the category names, and you can visually search the list to find the appropriate one. If you enter a category that iBank doesn’t already have, it opens a window to allow you to create a new category. You need to enter various bits of information about the category. iBank’s category organization structure is efficient and I recommend staying with their format. The need to locate a proper category occurs early on. Once you set up a rule or become familiar with the scheme, it becomes easy, however you can easily create all your own categories in a way that makes the most sense to you. This demonstrates another reason why iBank is a great choice for tracking your finances: there are so many ways to modify the application to get it to suit your personal methods. Some transactions move money from one account to another. When you download transactions, iBank compares the downloaded transactions to those already in the register. If it finds one that already exists, it automatically un-checks the accept check box, since the transaction already exists in both registers. If you did import it, there would be a duplicate transaction. When importing transactions, you need to look over the list and make sure that only the transactions you want to import have the check box checked. Had I known this when I first started downloading transactions, I could have saved myself a bit of time. Luckily, if you do duplicate a transaction, you need only delete the duplicate. The issue is realizing that it was done, which is a good reason for reconciling an account on a regular basis. I found a few inconsistencies with how iBank works with respect to transactions. The default transaction type often doesn’t make sense for the account type. For instance, when I download a new credit card transaction the type defaults to “Withdrawal” not “Charge” as I expect. For a new checking transaction that I enter manually as I write a check, it defaults to “POS”, not new check number. However, if I change the type to Check, it automatically chooses the next check number in my sequence. Note that if you create a rule with a particular store, the type of transaction is included in the rule, so the next time you download a transaction from that company, it is correct. iBank does a very good job of tracking investments. Overall, the process is very simple and intuitive, although there are a few things to remember. If you set up a new investment account to hold shares of various stocks, you need to enter the number of shares you own manually. The number of shares wasn’t transferred from the account I own. Once you enter the total number of shares, iBank will track the share value, provide a chart of the value over time, and even keep track of the cost basis of the stocks or mutual funds. When you manually bring an existing account into iBank, there are a few things to be aware of. First of all, any past account history is not brought into iBank. While some companies will provide cost basis for an account for iBank, many do not. You can add this information manually. iBank shows only the cash available in an investment account in the register, so if your account has only shares of stocks or funds, it will show as a zero value. The actual value of the account, based on share values as of the current quote download, shows up in the accounts side bar. The value is kept up to date by downloading stock quotes (which includes mutual fund quotes). During my tests I found that for accounts for which you download transactions, the auto method almost always creates a register that looks exactly like the statement from the financial institution. This is a real time saver, as all you need to do is enter the numbers, make sure the difference is zero, and you are done! If there are issues, you then need to figure things out, but this method is significantly faster then the manual method of adding transactions. Once you get all your accounts into iBank, there are two other things you might want to do. Track where your money goes and how much you have, and create a budget to help you better manage where your money goes and how much you save. iBank offers the tools to help with these items as well. While recording transactions is a very important part of any financial application, it isn’t everything. Some people like to look at where their money goes, how much their savings is worth, and to keep track of tax related transactions. iBank offers some built in reports as well as a set of very useful tools to create reports of your own. The reports themselves are interactive, so you can easily dig deeper into them if necessary (or if you are curious). The best way to explain this is to consider one of iBank’s included reports. The report called “Last month to date expenses” is an income and expense report. Click on the report icon in iBank’s source list (the left side bar) to run that report. 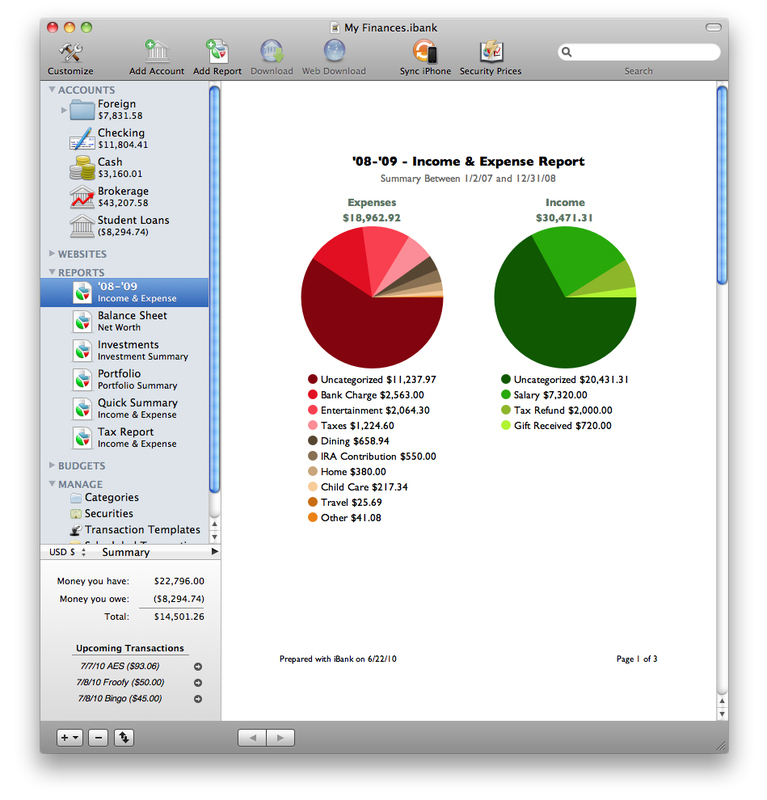 The program’s main window changes to show the report, and there are two pie charts on the top: one for expenses and one for income. Below the pie chart is a key, showing the names associated with the colors of the pie chart. Below the pie charts is a list showing the categories that make up the charts. Both the pie charts and the list of text data are interactive. When you click on a piece of the pie chart or an area in the list, iBank generates a sub report showing the accounts and/or transactions that make up this section. For instance, if the category is $500 on groceries, you can click on this then see a list of the different grocery transactions which make up the total. If you are inclined to keep precise records of your finances, this is a good way to make sure you didn’t accidentally include a transaction that doesn’t belong. It is also a good way to see where the money goes. You might find that most goes to a particular store. People who might use iBank to take control of their “Fun”spending, as they will easily see where the money goes if they keep good records! If you find reports useful, you will want to create your own reports. iBank makes the process relatively easy, yet offers the tools to do some very complex things. iBank lets you create reports by walking through a series of screens, each part setting up a different aspect of the report. You start with a report type, then specify specifically what items will be included and the dates to be covered. For example, one report I always set up is a list of charitable contributions I have made in the past calendar year. To create this report I choose Category Detail, include all accounts, but limit the category to charity contributions, set the date to last calendar year, and finally give it a name. Then, when I am working on my income tax, I can run this report, which will provide me with a nice list to print and include in my tax records. When creating a report, you can get pretty complex using iBank’s “Smart Rules”, which essentially is a group of nested “and” and “or” statements that limit or extend the included items. I have to admit I am not really a report kind of guy, so my use of reporting is very limited. However, it is easy to see that there is a lot of power in iBank’s report wizard to do some very specific things. Finally, you can easily create a budget for the next year using iBank’s budget tool. Just like the report tool, it is very easy to do. You predict your income first, then predict how much you will spend on various items in the budget. Obviously, any budget is only as good as the validity of the data you use. Often it is easier to create a home budget after you have collected a year or more of data on where your money goes (however, you might need to control the budget before collecting this data ☺). Also consider that people prone to spend too much might well served by creating a budget on specific “fun” or entertainment items. Once the budget is created, iBank offers two ways of looking at the information. First is the traditional view, which is a window that lists your incomes (on the top of the screen) and expenses (on the lower part of the screen), showing the budget, actual to date, and amount remaining (over). Each line is followed by a bar graphically showing how much of the budget is remaining (or how far past the value you are). The bar is green for under and red for over and yellow for getting close to the limit. Using this chart, you can easily monitor where you are. The bar graphs give a quick visual review of items. The middle of the screen shows a “remaining cash to spend” as a total, along with a bar graph, and a summary of total incomes/expenses, budgeted versus actual. This is a very useful to easily monitor and keep an eye on the budget. As with many other screens in iBank, this one is interactive. If you click on an item, you go into an edit mode, allowing you to modify the budget item (come on, no cheating here, this is really important!!). I do disagree slightly with their handling of incomes. People are paid on a weekly, bi-weekly, or monthly basis. This means that for income, you will be under budget until some time near your last pay period, giving a negative impression for a normal sequence of events. However, budgets are more about watching where the money goes rather then where it comes from. Unless, of course, you are in a field where you have to create income and need a little push to get you going. iBank offers another method of monitoring budgets, called the envelope method. This is a very practical method for people who don’t use a program iBank does a great job implementing this process. Using this method you have an envelope representing an amount of cash to spend on different budget items. There is one for food, one for housing, one for keeping the car going and so on. When you need to pay for something, you take money from the envelope for that item. You can also move additional money into an envelope if necessary. The idea behind this method, is that you can see how the envelope empties as you spend money. It is a very visual method and has been used by a lot of people to help them take control of their finances. iBank shows a screen of envelopes; nice green bills stick out the top of an envelope and the envelope shows a black positive number when it is positive. For over budget items, the envelope is closed, the number is red and in parenthesis. The lay out is similar to the the first method with incomes on the top, expenses on the bottom and the middle with some summary information. With this method, it doesn’t show you where you are relative to the period, but the income area shows how much unspent money you have, while the expense area shows how much of each envelope’s total you have spent already. The summary area show how much over or under budget you are and offers a table of days left to the period (usually a month), how much is available (positive or negative), and how much reserve cash you have. The vendor is very active in updating and improving this program. They host a very active forum where people can ask questions and get answers from users and staff. Their tech support was quick and very helpful. They appear to listen to the comments made by users, and act to modify the program when it makes sense. There were a couple of things that changed while I as working on this review, making the program even better. This commitment to customer service is another great aspect of iBank. I highly recommend this program. Overall, iBank is a terrific program. Having used it for a while, I find that it is actually more comprehensive and logical than my previous version of Quicken. iBank offers tools for importing your data from other programs, and gives you a wealth of tools for controlling your personal finances. I found iBank to be very easy to use and relatively easy to covert to. The vendor even offer a free download with a 30 day trial period, so how can you go wrong with that?